Wealth management software provides portfolio management, trading, compliance and manager/sponsor communication capabilities. Charles River’s Wealth Management Solution aims to helps wealth managers, private banks and financial advisors support discretionary and non-discretionary private wealth products, enhance mobility, and efficiently manage their book of business. Comprehensive multi-asset/multi-currency functionality supports tailored portfolio strategies such as separately managed accounts (SMAs) and unified managed accounts (UMAs). 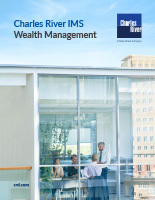 Charles River Wealth Management Solution supports the entire investment lifecycle, including model management, portfolio management, trading, compliance, reporting, and position-keeping capabilities in a single, integrated solution. 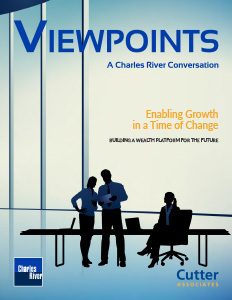 Charles River improves scalability via the Central Workbench (CWB) and an Investment Book of Record (IBOR). The CWB supports exception-based workflows to identify accounts requiring attention and provides managed account overlay functionality that meets the demanding portfolio management requirements of high-volume sponsor firms. IBOR helps firms manage large volumes of accounts and positions, and is critical for managers running UMA programs whose accounting systems do not differentiate between sleeves. An integrated Wealth Hub automates and streamlines communication between asset managers and sponsors for model updates, trades/allocations, positions/cash, and intra-day account instructions. Charles River Anywhere provides browser-based access to a full suite of portfolio management tools integrated with an order and execution management system. Charles River Mobile provides financial advisors with tablet and smart phone access to key account information for improved engagement with high-touch client relationships. Charles River Wealth Management Solution provides extensive compliance and surveillance capabilities to help wealth managers and advisors mitigate reputational and regulatory risks. The solution automates compliance across the trade lifecycle and provides firms with centralized compliance monitoring and management. Scalable compliance engines support high volumes of trades, compliance rules, accounts, and groups of accounts. 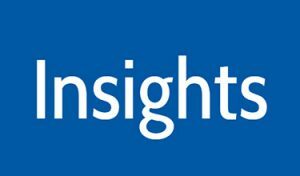 Nightly portfolio compliance monitoring identifies portfolio drift against the Investment Policy Statement and flags any excessive exposures requiring action. Managers can minimize portfolio drift using automated rules-based rebalancing capabilities. A detailed audit trail captures all rebalancing and order generation activity for each session. Charles River’s surveillance capabilities help firms adhere to Investment Policy Statement targets by supporting implementation and enforcement of client and firm mandates. Real-time auditing can flag suspicious trades and help enforce product selection suitability. A comprehensive view of portfolio holdings makes risk exposures and illiquid positions easily visible to wealth managers and compliance officers. Charles River recently hosted a panel discussion with industry thought leaders to discuss challenges in the wealth management industry and how firms are adapting. In particular, the group focused on viewing financial advisor experiences through a technology lens that enables growth and agility. Looking for a Wealth Management Solution?